National Security Advisor Unveils Administration's Africa Strategy AFPS 13 Dec 2018 -- National Security Advisor John Bolton today unveiled the Trump administration's Africa strategy designed to counter Chinese influence on the continent and push African nations to show some results from the aid they receive from the United States. Sweeping Change to US Policy for Africa Announced VOA 13 Dec 2018 -- The United States is immediately instituting a new policy for Africa that was just approved by President Donald Trump, his national security adviser, John Bolton, announced Thursday. U.S. Africa Command is responsible to the Secretary of Defense for U.S. military relations with 53 African countries, including the Islands of Cape Verde, Equatorial Guinea and Sao Tome and Principe, and the Indian Ocean islands of Comoros, Madagascar, Mauritius, and Seychelles. U.S. Central Command maintains its traditional relationship with Egypt, but AFRICOM coordinates with Egypt on issues relating to Africa security. 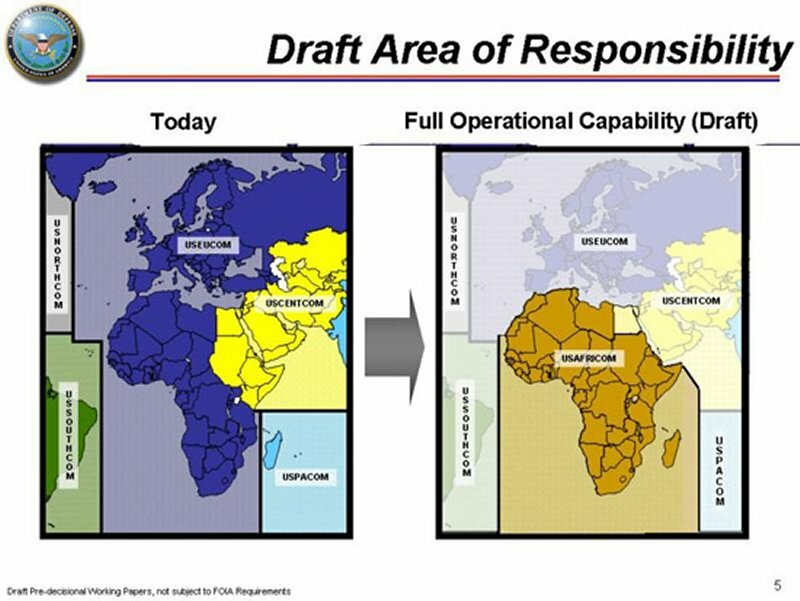 AFRICOM’s area of responsibility (AOR) includes an area that includes about 35 percent of the world’s land mass and 25 percent of its population. The US army will withdraw hundreds of troops conducting counterterrorism operations across Africa over the next several years, the Pentagon has said, in a move that comes amid efforts to prioritise resources "for long-term competition with China and Russia". Currently, about 7,200 US military personnel are based in dozens of African nations, with notable footprints in countries such as Somalia, Nigeria and Libya. Commander Candice Tresch, Pentagon spokesperson, said on 15 November 2018 that figure would be reduced by about 10 percent over the next few years. Pentagon officials said they would cut roughly 700 of the 7,200 U.S. troops on the African continent. The reductions, officials said, were to "optimize" special operations forces that would be needed in a potential future fight against near-peer competitors like Russia or China. The commander of U.S. forces in Africa cast doubt on whether the Pentagon will complete plans to cut forces in Africa by 10 percent as the Department of Defense announced. Marine Gen. Thomas Waldhauser, who heads U.S. Africa Command (AFRICOM), told lawmakers 07 March 2019 he already has reduced force numbers in Africa by about 300. But commanders appear to be rethinking plans to cut an additional 400 troops from the continent. "Whether we'll ever be directed to execute the second half [of cuts] is to be determined," Waldhauser said. Donald Trump has often touted his America First policy since his ascendency to office two years earlier. His immigration policies, the reduction in funding for peacekeeping missions and the UN Population Fund, as well as the country’s withdrawal from the UN Human Rights Council, UNESCO, and the Paris climate change agreement, have made his stance even clearer. And for Africa, all the signs are there. Trump’s travel ban targeted people from several Muslim-majority countries, including some African countries, and South Africa and Egypt became victims of his protective tariffs on steel and aluminium. In January 2018, he reportedly described African states as ‘shitholes’. And it took his administration about 18 months to appoint an assistant secretary of state for African affairs at the Department of State. But a new National Defense Strategy, unveiled in January 2018, has seen America move slightly away from fighting terrorism towards a more focused ‘great power competition’ with China and Russia. The US remains the continent’s largest investor with some $54 billion of foreign direct investment stock. On 13 December 2018, at the Washington-based think tank Heritage Foundation, John R. Bolton, Trump’s national security adviser, outlined the administration’s new strategy for Africa. Again, at the heart of the strategy is a ploy to counter Russian and Chinese influence, which Bolton did not gloss over. The new strategy would, he told the audience, focus on promoting trade and commercial ties, countering terrorism and violent conflict, and providing foreign aid “efficiently and effectively.” A new initiative Prosper Africa, would be implemented to support US investment across Africa, increase the continent’s middle class and improve business environments in the region. John Bolton, announced "Under our new approach, every decision we make, every policy we pursue, and every dollar of aid we spend will further U.S. priorities in the region," said Bolton, speaking in Washington. "Our first priority, enhancing U.S. economic ties with the region, is not only essential to improving opportunities for American workers and businesses. It is also vital to safeguarding the economic independence of African states and protecting U.S. national security interests." The policy shift is also meant to counter on the continent the rapidly expanding financial and political influence of China and Russia. "They are deliberately and aggressively targeting their investments in the region to gain a competitive advantage over the United States," Bolton said at the Heritage Foundation, a conservative think tank. "We want our economic partners in the region to thrive, prosper and control their own destinies. In America's economic dealings, we ask only for reciprocity, never for subservience." On February 6, 2007, President Bush and Defense Secretary Robert Gates announced the creation of U.S. Africa Command. The decision was the culmination of a 10-year thought process within the Department of Defense (DoD) acknowledging the emerging strategic importance of Africa, and recognizing that peace and stability on the continent impacts not only Africans, but the interests of the U.S. and international community as well. Yet, the department's regional command structure did not account for Africa in a comprehensive way, with three different U.S. military headquarters maintaining relationships with African countries. The creation of U.S. Africa Command enabled DoD to better focus its resources to support and enhance existing U.S. initiatives that help African nations, the African Union, and the regional economic communities succeed. It also provides African nations and regional organizations an integrated DoD coordination point to help address security and related needs. The African continent was initially divided among three combatant commands: U.S. European Command, U.S. Central Command and U.S. Pacific Command. US Central Command had responsibility for Egypt, Sudan, Eritrea, Ethiopia, Djibouti, Somalia and Kenya. U.S. European Command had responsibility for the rest of the nations in the African mainland. US Pacific Command had responsibility for Madagascar, the Seychelles and the Indian Ocean area off the African coast. This division of Africa, within the UCP, led to the creation of "seams" between the current combatant command boundaries. EUCOM's focus is based on their expansion into the newest NATO countries on their Eastern border. CENTCOM's focus for the indefinite future is on OEF, OIF, and the future of U.S. presence in the Middle East. PACOM's focus has been and remains on the Asian continent. 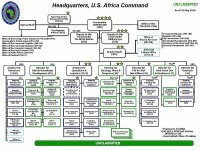 Established as a sub-unified command in October 2007, U.S. Africa Command was subordinate to U.S. European Command during a year-long transition period. 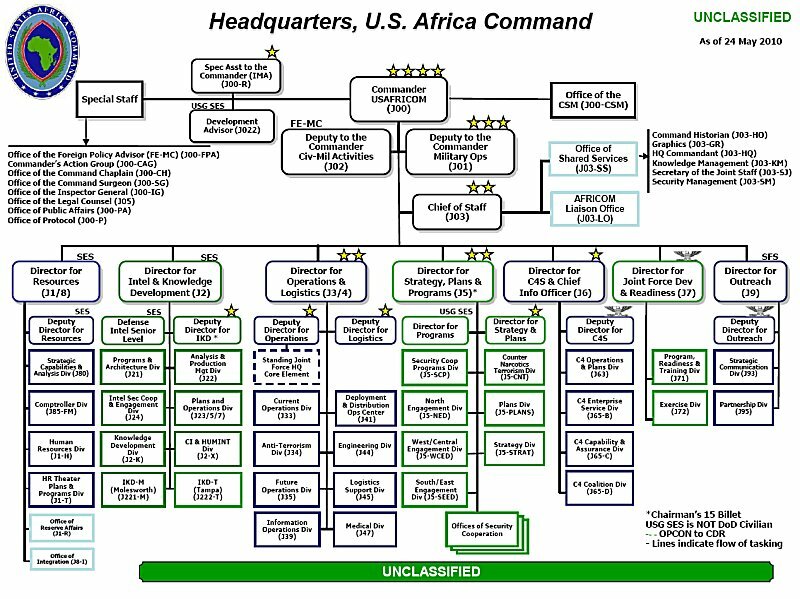 Upon becoming a unified regional command in October 2008, the commander of Africa Command reports to the Secretary of Defense, as do all the other unified commanders in the Department of Defense. The U.S. Department of State will continue to be the primary U.S. government agency responsible for U.S. foreign policy and diplomacy. Ambassadors at U.S. Embassies in Africa will continue to be the President's personal representatives to host-nation governments and international organizations. The U.S. Africa Command will work closely with, and in support of, U.S. Embassies and diplomatic missions. The U.S. Agency for International Development (USAID) will continue to be the lead U.S. agency for development and humanitarian activities. The U.S. Africa Command transition team was budgeted for approximately $50 million in Fiscal Year 2007, and the command received $75.5 million for Fiscal Year 2008 and $310 million for Fiscal Year 2009. The designers of U.S. Africa Command clearly understood the relationships between security, development, diplomacy and prosperity in Africa. 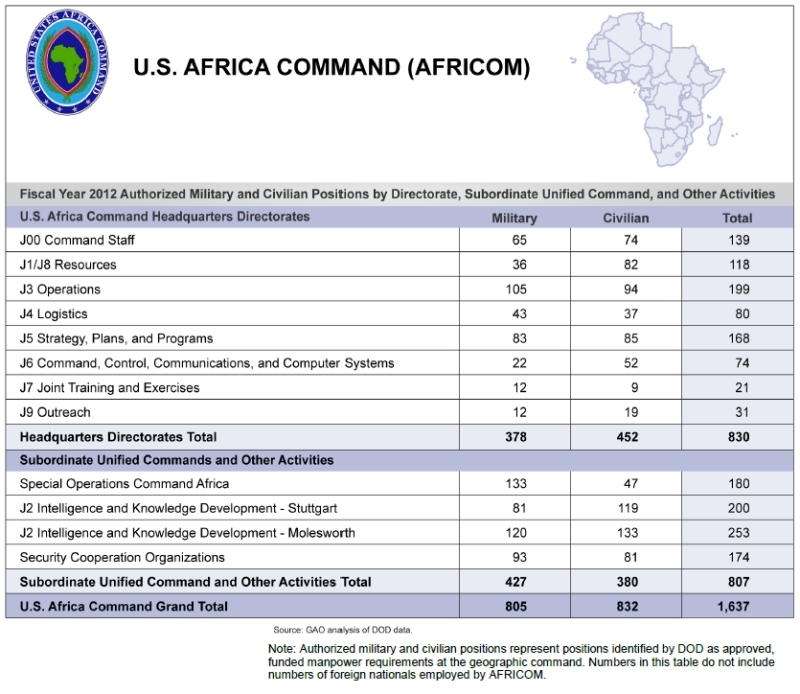 As a result, U.S. Africa Command, or AFRICOM, reflects a much more integrated staff structure, one that includes significant management and staff representation by the Department of State, U.S. Agency for International Development (USAID), and other U.S. government agencies involved in Africa. The command also will seek to incorporate partner nations and humanitarian organizations, from Africa and elsewhere, to work alongside the U.S. staff on common approaches to shared interests. United States Africa Command, in concert with other U.S. government agencies and international partners, conducts sustained security engagement through military-to-military programs, military-sponsored activities, and other military operations as directed to promote a stable and secure African environment in support of U.S. foreign policy. China became Africa's top trade partner in 2009. Bilateral trade hit nearly $200 billion in 2012. Some Africans believe they are getting the short end of the stick, however, as they export valuable natural resources to China without receiving much in return by way of jobs or revenue. By 2013 a newfound pragmatism was showing up in many different places at the same time, which was creating the impression that there was some kind of rolling back of the Chinese-African relationship. Africans are much more sober about what it will take to engage China on a level playing field. It's becoming quite clear that the Chinese are just as vigilant about potential profits as the Western firms and the Western governments are. And for that reason, there is less of that wide-eyed enthusiasm about China. African countries, like Niger and Gabon, just want to get more for their natural resources - more state revenue, more local jobs and a better standard of living. Worldwide demand for resources like oil, coal, iron ore and uranium has strengthened their bargaining position. China is the world's second largest consumer of oil after the United States. It gets about a third of its oil from Africa. Many countries are also increasingly concerned about exploitative or illegal practices. In places like Zambia or Ghana, there is a lot of resentment against the Chinese and a lot of pressure on the government to avoid granting concessions to Chinese companies. In the longer term, pressure from below may really be the challenge for the China-Africa relationship. African countries are setting quotas on the number of foreign employees that companies bring in, and are demanding that investors build refineries to process raw resources locally. The creation of U.S. Africa Command did not mean the U.S. military will take a leading role in African security matters, nor will it establish large U.S. troop bases. Rather, Africa Command is a headquarters staff whose mission entails coordinating the kind of support that will enable African governments and existing regional organizations, such as the African Standby Force, to have greater capacity to provide security and respond in times of need. Africa Command builds on the many African-U.S. security cooperation activities already underway, yet will be able to better coordinate DoD support with other U.S. government departments and agencies to make those activities even more effective. The command's focus during its first year was to build a unique organization dedicated to long-term partnerships. The transition team was based at Kelley Barracks, Stuttgart, Germany. DoD's plan is eventually to place AFRICOM headquarters in Africa. U.S. Africa Command will be headquartered at Kelley Barracks in Stuttgart, Germany, for the foreseeable future. The command inherits a small but meaningful U.S. military presence already existing in numerous African nations, to include Camp Lemonier in Djibouti, as well as Defense Department personnel assigned to U.S. Embassies and diplomatic missions to coordinate Defense Department programs supporting U.S. diplomacy. Any additional presence on the continent will take place only in full diplomatic consultation and agreement with potential host nations. U.S. Africa Command will focus on synchronizing hundreds of activities inherited from three regional commands that previously coordinated U.S. military relations in Africa. The goal is for AFRICOM not to be a US leadership role on the continent but rather to be supporting the indigenous leadership efforts that are currently going on. The US supports the leadership from different nations and that of the AU and the regional economic communities that are there and the security capabilities that they provide. The purpose of the command, which came out of the QDR, is what DOD refers to as anticipatory measures, those are taking actions that will prevent problems from becoming crises, and crises from becoming conflicts. So the mission of the command is to be able to prevent that. Its principle mission will be in the area of security cooperation and building partnership capability. It will not be in warfighting. The nature of the security challenge in Africa is not one of states fighting states, but it is one of states coming to grips with their own internal defense, or trying to collectively work against transnational threats. And so to the degree which the US would be doing that, and the principal mission of AFRICOM, is to help the Africans to be able to meet those challenges themselves. With the ACOTA program and a number of different programs, resources are going there now. AFRICOM would be the one that would take a lead from the Defense Department aspect of that. It will allow the DOD to do a job better. As the Africans see the stand-up of AFRICOM, they should not look at it as a here's another donor, here's another source of revenue; rather it is someone who's going to come and share their knowledge, know-how along a path that the Africans have chosen to help them to better be able to a job for themselves. AFRICOM would be unique in that a deputy commander in AFRICOM will be a civilian. The first one will be a representative from the State Department. Many of the missions AFRICOM will perform will be non-kinetic, such as humanitarian assistance and disaster relief. If there wbere kinetic operations going on, that would only be done through the military chain of command. The civilian deputy would not be in the chain of command for those. AFRICOM will be unique in the amount of interagency cooperation it will involve. The command's headquarters will include representatives from the State Department and other government agencies, and DoD will work closely with the African nations in developing the structure of the command and possible missions. AFRICOM was not being stood up in response to Chinese presence on the continent. It was not being stood up solely for the effort of enhanced counterterrorism, and it was not being stood up in order to secure resources, a particular sensitivity to the oil resources. While some of these may be part of the formula, the reason that AFRICOM is being stood up is, Afric is emerging on the world scene as a strategic player, and the US needed to deal with it as a continent. AFRICOM does not mean that there would be additional U.S. forces put on the continent. It is an organizational and a staffing structure, it is not an operational entity. It will coordinate the efforts of operational forces, but those would principally be in the areas of joint exercises. AFRICOM does not mean the dramatic increase in resources to the African continent from the Department of Defense or from the US government. The Bush Administration has made significant investment in the improvement of the quality of life on the African continent, increasing it over threefold. And AFRICOM would be there to coordinate the department's efforts, with other elements of the US government, to make those investments successful. By early 2007 not all the decisions regarding AFRICOM and the details of the execution had been made. And that's why the US was consulting with African governments, to get their insights and perspectives so that when AFRICOM did stand up, that it could be as friendly to working with the host nation governments there as possible. Despit a strong contract presence in Africa, the US government and government employees will be the ones there making the decisions. To the degree which they will be supported by contractors, the government will look at is who can do the job best and what's in the best interests of the US government and what's in the best interests of the African nations. On 24 April 2012, Seventeenth Air Force, previously designated as the air component command for US Africa Command (AFRICOM) was inactivated. United States Air Forces in Europe (USAFE) was subsequently designated as the air component command for AFRICOM. In January 2013, the Secretary of Defense decided to keep AFRICOM's headquarters in Stuttgart, Germany. This decision was made following the completion of an analysis directed by the House Armed Services Committee in 2011 and conducted by the Cost Assessment and Program Evaluation (CAPE) office. The purpose of the CAPE study was to present the strategic and operational impacts, as well as the costs and benefits, associated with moving AFRICOM headquarters from its existing location in Germany, where it had been established on what had been intended to be a temporary basis, to the United States. 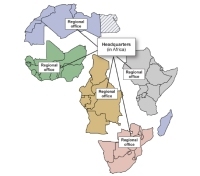 DOD considered 2 options for the basing of AFRICOM headquarters in the study: (1) maintain AFRICOM's existing location in Stuttgart, Germany, or (2) relocate AFRICOM headquarters to the United States. However, the CAPE study also included a mitigation plan to address strategic and operational concerns identified by leadership as factors to consider in event that AFRICOM were relocated to the United States. A main finding of the DOD study was that firstly the annual recurring cost of maintaining a US-based headquarters would be $60 million to $70 million less than the cost of operating the headquarters in Stuttgart. The break-even point to recover one-time relocation costs to the United States would be reached between 2 and 6 years after relocation, depending on the costs to establish facilities in the United States. Secondly, relocating AFRICOM to the continental United States could create up to 4,300 additional jobs, with an annual impact on the local economy ranging from $350 million to $450 million. Lastly, the study stated that the AFRICOM commander had identified access to the area of responsibility and to the service component commands as critical operational concerns. The study also presented an option showing how operational concerns could be mitigated by basing some personnel forward in the region. However, it stated that the commander had judged that the command would be less effective if the headquarters were placed in the United States. When Secretary of Defense Leon Panetta wrote to congressional leaders in January 2013, notifying them of his decision to retain AFRICOM in Stuttgart, the Secretary cited the judgment of the AFRICOM commander about operational effectiveness as a rationale for retaining the command in its existing location. In September 2013, the Government Accountability Office released a report reaching the conclusion that DOD needed to reassess options for permanent locations of AFRICOM's headquarters. 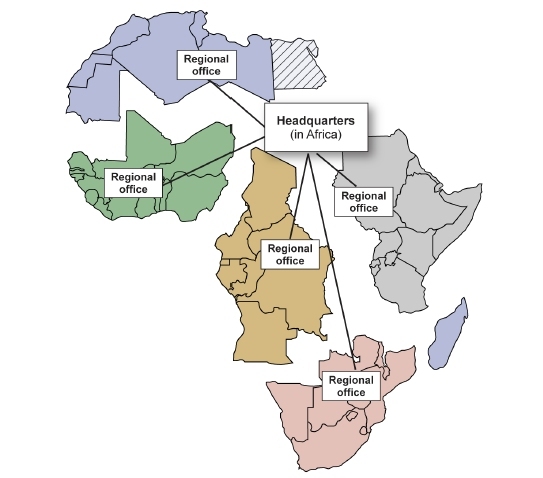 When the decision was made the establish AFRICOM in 2007, the initial plan was for AFRICOM was to have a central headquarters located on the African continent that would be complemented by several regional offices that would serve as hubs throughout AFRICOM's area of responsibility. 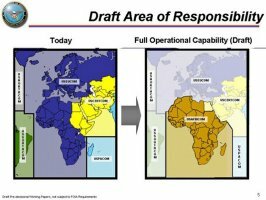 According to DOD officials, having a command presence in Africa would provide a better understanding of the regional environment and African needs; help build relationships with African partners, regional economic communities, and associated standby forces; and add a regional dimension to US security assistance. However, after conducting extensive travel throughout Africa to identify appropriate locations and meet with key officials in prospective nations, DOD concluded that it was not feasible to locate AFRICOM's headquarters in Africa, for several reasons. First, State officials who were involved in DOD's early planning teams for AFRICOM voiced concerns over the command's headquarters location and the means by which the AFRICOM commander and the Department of State would exercise their respective authorities. Specifically, DOD and State officials said that State was not comfortable with DOD's concept of regional offices because those offices would not be operating under the Ambassador's Chief of Mission authority. Second, African nations expressed concerns about the United States exerting greater influence on the continent, as well as the potential increase in US military troops in the region. Third, since many of the African countries that were being considered for headquarters and regional office locations did not have existing infrastructure or the resources to support them, DOD officials concluded that locating AFRICOM headquarters in Africa would require extensive investments and military construction in order to provide appropriate levels of force protection and quality of life for assigned personnel. Officials were also concerned that if the headquarters were located in Africa, assigned personnel would not be able to have dependents accompany them because of limited resources and quality-of-life issues. After AFRICOM was established in 2008, a review of potential permanent headquarters locations in Europe and the United States was conducted, but DOD decided to defer any final decision until the Command had reached its full operational capability, slated at that time for 2012. In 2011, the Office of the Under Secretary of Defense for Policy and the Joint Staff conducted a study that considered alternatives to the existing geographic combatant command structure that could enable the department to realize a goal of $900 million in cost reductions between FY14 and FY17. As part of DOD's overall effort to reduce recurring overhead costs associated with maintaining multiple combatant commands, the study considered merging AFRICOM with either EUCOM (also located in Stuttgart, Germany) or SOUTHCOM (located in Miami, Florida). The study concluded that these 2 options were neither "strategically prudent" nor "fiscally advantageous," stating that combining combatant commands would likely result in a diluted effort on key mission sets, and that the costs incurred by creating a single merged headquarters would offset the available cost reductions. The study additionally found that altering the contemporaneous geographic combatant command structure would result in cost reductions well below the targeted $900 million. Subsequently, DOD determined that it would need to identify other ways to realize its goal of finding savings from combatant commands, and the department changed the timeframe to FY14 through FY18. According to Joint Staff officials, DOD would seek to accomplish this goal by reducing funding in the President's budget request for FY14 across all the geographic and functional combatant commands by approximately $881 million for fiscal years 2014 through 2018. To realize these savings, these officials stated that the department would reduce the number of civilian positions at the combatant commands and Joint Staff by approximately 400 through fiscal year 2018, but they provided few specifics to GAO when it conducted its review in 2013. Furthermore, this had not prevented the various services from largely merging or otherwise collocating their combatant commands assigned to AFRICOM and EUCOM. Commander, Naval Forces Europe was immediately dual-hatted as Commander, Naval Forces Africa following the activation of the latter. Similarly, the commander of EUCOM's Southern European Task Force also became the Commander of US Army Africa. In 2012, the separate US Air Forces Africa was inactivated with the responsibility merged with Air Forces in Europe. US Marine Corps Forces, Africa was established as a separate command, but was collocated with US Marine Corps Forces, Europe, and headquartered in Germany. AFRICOM's theater special operations command was also headquartered in Germany. The 2007 plan and the reviews in 2008 and 2011 were ultimately followed by the 2013 CAPE study. GAO's review said, however, that the CAPE study did not conform with key principles GAO had derived from a variety of cost estimating, economic analysis, and budgeting guidance documents, in that (1) it was not well-documented, and (2) it did not fully explain why the operational benefits of keeping the headquarters in Stuttgart outweigh the benefit of potentially saving millions of dollars per year and bringing thousands of jobs to the United States. DOD responded that part of the decision making process, notably the combatant commander's judgment, was not readily quantifiable, to which GAO responded that it believed that an accurate and reliable analysis should provide a more complete explanation of how operational benefits and costs were weighed, especially in light of the potential cost savings that DOD was deciding to forego. GAO also pointed out that other commands, such as CENTCOM and SOUTHCOM, were operating in the manner proposed, with headquarters in the United States and smaller forward headquarters locations in the area of responsibility. GAO noted that AFRICOM in fact already had such a forward operating element on the African continent in the form of CJTF-HOA in Djibouti. These factors informed GAO's conclusion that to enable DOD to meet its Africa-related missions at the least cost, it was recommends that the Secretary of Defense conduct a more comprehensive and well-documented analysis of options for the permanent placement of the headquarters for AFRICOM, including documentation as to whether the operational benefits of each option outweigh the costs. These options should include placing some AFRICOM headquarters personnel in forward locations, while moving others to the United States. Should DOD determine that maintaining a location in Stuttgart was in fact the best course of action, the Secretary of Defense should provide a detailed description of why the operational or other benefits outweigh the costs and benefits of relocating the command. As the along the West African coastline. se coastal states become more alert to the growing threat to their fishery resources, they are inclined to beef up their navies' capabilities in fisheries protection. The trend to reduce exploitation by foreign fishing fleets is encouraging for the future economic success and nutritional self-sufficiency of these developing nations, and this also encourages their western friends and supporters. Even the few West African navies with suitable assets for maritime law enforcement (MLE) suffer from limited operating budgets, weak national fishing regulations, and often a lack of the political will to seize and prosecute offenders. The difficulties in the region are further compounded by insidious corruption among some of the local bureaucrats who profit from deliberate fisheries mismanagement. The U.S. Department of Defense interest in protecting West African fisheries dates back to the Fall of 1983, when former Principal Deputy Assistant Secretary of Defense, Noel Koch, and former Coast Guard Commandant, Admiral James Gracey, made simultaneous visits to the West African littoral. While there, they were alerted to the magnitude and devastation of illegal foreign fishing. Their meeting led to the convening soon thereafter of an interagency group in Washington to address this serious problem. Participants included officials from the State Department, DOD, U.S. Navy, Coast Guard, and National Marine Fisheries Service. Less than two years later, the ACS program was in operation. Initially, the program's intent was to provide new patrol boats and surveillance aircraft to African navies. subsequently, in reaction to fiscal pressures on the U.S. budget, the emphasis of ACS shifted toward upgrading operational surveillance platforms, fixing those in disrepair, building and refurbishing shoreside support facilities, and improving the command, control, and communications capabilities of existing navies. Equally important was the program's emphasis on providing Coast Guard MLE training to West African littoral states and programming their naval students for coastal security instruction in US Navy and Coast Guard schools in the United States. The ACS program was jointly directed by the Office of the Assistant Secretary of Defense for International Security Affairs and the State Department. The specific design and day-to-day management of the projects, however, were largely accomplished in the Africa Division, Logistics Directorate, Headquarters U.S. European Command, in Stuttgart, West Germany. ACS projects were nominated by American Embassies to the unified commands. To start the process, survey teams composed typically of unified command, US Navy, and Army Corps of Engineer representatives worked with host nation navy representatives in respective countries to examine the feasibility of a project and advise U.S. Embassy personnel on ACS program planning. One of the most successful efforts under ACS was the deployment of U.S. Coast Guard MLE training teams to West Africa. An MLE team spent several weeks each with the navies of Mauritania, the Gambia, and Senegal in April and May 1987. In June and July 1988, two additional MLE teams provided similar instruction to Liberia, Guinea, and Guinea-Bissau. The instruction focused on developing procedures for effective maritime interdiction operations, and included practice boardings of host nation fishing vessels. Specialized classroom and hands-on training in search and rescue basic seamanship, electronics and engineering preventive maintenance techniques, and shipboard damage control and fire fighting were also conducted upon request. In addition to instruction, the Coast Guard teams also typically performed repairs of electronic and engineering equipment aboard patrol boats and at shore stations. Prior to departure, these teams offered specific advice on how each nation could improve its fisheries protection, including changes to existing fisheries laws, recommendations on establishing an operations center, increasing air surveillance, etc. The ACS program also complemented other US security assistance programs aimed at improving the capabilities of West African navies. Cameroon, Guinea, and Equatorial Guinea obtained patrol boats, through Military Assistance Program (MAP) grants or U.S. credits, to patrol their riverine and coastal waters. ACS teams visited these countries to assist in planning the better use of these craft, including providing training recommendations. An important dimension of the ACS program from the outset was the encouragement of regional cooperation among African coastal states. The limited amount and marginal condition of their naval assets strongly favored adopting a cooperative strategy toward solving common coastal security problems in the region. Despite inherent difficulties associated with international cooperation within West Africa (e.g., language barriers, traditional mistrust, etc. ), significant cooperation has taken root among several coastal countries. Informal "hot pursuit" agreements between neighboring navies and the exchange of spare parts for shipyard services are two examples. Establishing naval communication links and conducting joint surveillance patrols would also be effective measures. These kinds of partnerships must continue and develop further if the region is to successfully counter the increasing threat to its fisheries. Another tenet of the ACS program was to encourage Western Allied participation in ACS. Since the former colonial powers, primarily France and England, have significant influence in West Africa, the US State Department, Defense Department, and HQ USEUCOM have sought their cooperation in implementing certain projects under the ACS program. ACS activities have also been coordinated with other donor states and international agencies. ACS rapidly became a significant and promising U.S. program for West Africa. Through direct assistance and close consultation at a variety of levels, ACS encouraged the coastal states to increase their navies' emphasis on maritime law enforcement. This emphasis has begun to make a difference, not only in the growing focus of host nation officials on the general problem of protecting their valuable fisheries resources, but also in the specific need to increase surveillance patrols and seizures of domestic and foreign fishing vessels found to be in violation. This has led several states to become disenchanted with exploitative foreign fishing partners, leading to canceling or renegotiating existing fishing treaties, under more favorable terms. Countries that heretofore kept American military representatives at arms length are no longer doing so to the same extent. For example, ACS projects in Guinea and Guinea-Bissau have promoted new and friendly relations with the U.S. military. Further, the morale of participating West African navies has improved. For the first time, they are optimistic about their future capability to protect their nations' marine resources and their coastlines. However, the sheer magnitude of illegal fishing compared to the limited assets of the existing patrol forces means that progress will not be rapid. Effective deterrence against relentless foreign fishing along the West African coastline will require, along with other measures, a significant increase in joint aircraft and patrol boat surveillance operations. On a continent whose natural resources have been ravaged and squandered, the ACS program represented a fleeting opportunity to assist in the rescue and preservation of one of these precious resources.